The Nesco ST25-F Steamer cooks a wide variety of foods including grains, vegetables, fruits, eggs, seafood, meat and poultry. 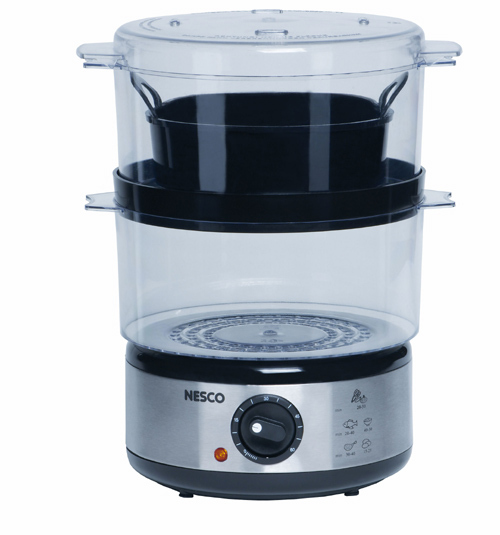 The Nesco 5 quart Steamer comes with a 60 minute timer and is equipped with an automatic shut-off when out of water. This unit makes the perfect rice, vegetable, meat, and quinoa cooker. Provides easy preparation for all the distinct flavors and fresh tastes of steamed food with amazing convenience. Featuring 400 watts of heating power, 2 steam bowls, a 2-cup rice bowl and 0-60 minute timer. 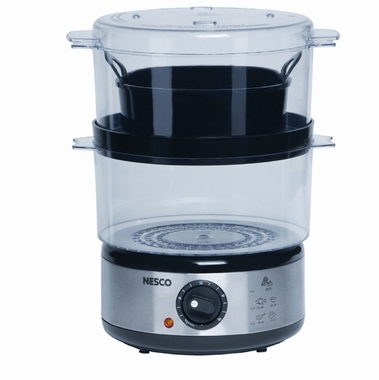 The Nesco 5 quart Steamer provides the power and versatility to easily obtain the perfect cooking consistency for all of your favorite rice dishes, veggies and an almost unlimited assortment of other tasty meals. 2-cup rice bowl works great for eggs, tamales and many other steamed dishes. The Generous 5-quart bowls and 2-cup water reservoir is great for family-size portions. Monitor your food without losing steam with our durable plastic steaming trays. Attractive Stainless Steel outer body design.